Frank Cox got lung cancer at the same age his dad died from it. FRANK COX KEPT getting chest infections in 2006 and 2007 – they just wouldn’t clear up. 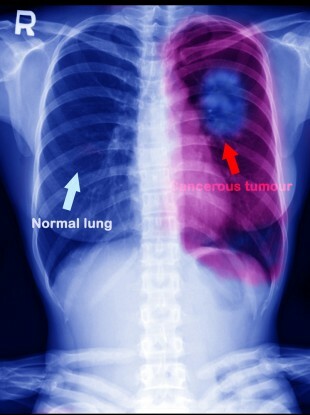 Eventually his GP sent him for a chest X-ray which confirmed his worst fear: he had lung cancer. He was 66 years old at the time – the same age his father was when he died from the disease in 1961. “You’re sort of in denial when you’re told, you think: ‘It’s not happening to me.’ I was off the cigarettes for 16 years at that stage, but the damage was done: I was on them since I was 16 or 17 years old. “The doctor said I had given myself a chance by giving them up. He told me if I was still smoking we wouldn’t be doing surgery, we’d be doing chemo to prolong my life, not save it,” Frank recalls. Luckily his cancer was detected at a very early stage. He successfully underwent surgery and three months of chemotherapy. Frank (now 73) got the five-year all-clear in 2012. I miss that bit of lung they took away – not badly, mind you. I can climb stairs, but I would feel it if I was rushing or ran somewhere … If you saw a bus coming and you made a dart for it, that’s when you’d miss it. Frank now does peer support with the Irish Cancer Society (ICS), where he talks to newly-diagnosed patients over the phone. When I was diagnosed I didn’t know anything about it. I wanted to talk to somebody who had been diagnosed and had surgery and come out the other side. It’s different to hearing from doctors and nurses, you need to speak to somebody who has been through it. Aoife McNamara is a Lung Cancer Information Nurse with the ICS. She said that increased awareness of the disease is needed as it is now the “biggest cancer killer in Ireland and worldwide”. About 1,800 people die from lung cancer in Ireland each year. Frank (far left) at an ICS awareness-raising event outside Leinster House. Aoife said women are becoming more at risk of the disease than they once were. The mortality rate of lung cancer among men has decreased in recent years while the rate in women has steadily increased. The mortality and incidence rates in Irish women are among the highest in Europe. Lung cancer might have been seen as a man’s disease, but that’s not the case any more. Aoife said this is directly linked to an increased number of women taking up smoking. She said that thanks to various campaigns, women in Ireland are “very breast aware” when it comes to cancer symptoms. Aoife said it’s important for people to know the symptoms of lung cancer and go to their GP if they’re concerned. Aoife said 90-95% of lung cancer cases are directly linked to smoking. She said anyone trying to give up cigarettes should contact the National Smoker Quitline on Freephone 1800 201 203. If you’re looking for information about any type of cancer, call the National Cancer Helpline for free on 1800 200 700 or visit the ICS’s website. Email “'I miss that bit of lung they took away - not badly, mind you'”. Feedback on “'I miss that bit of lung they took away - not badly, mind you'”.